The Chapter starts with Lilia who is running all excited towards Reverto´s House, in order to see Lute who was sleeping very deeply with Navirou; Lilia wakes Lute and Lute wakes Navirou. In any case, Lilia explains to lute that she has found in a book about some place that might as well have Kinship Ore. The Kinship Boulder that it is at the northwest of Gildegaran. So of course Lute, Lilia and Navirou will go there! They give their good byes to Reverto, who was mostly not interested and quite sleepy and leave. After they leave Debli comes knocking the door and gives Reverto his sad news… He won´t be a hunter anymore; but a Rider! To the “Lone Wolf and Extraordinary Hunter”, he couldn´t care less. Little before heading to the forest, the group went to see if Cheval and the others would like to join them; but it seems that they have taken a Quest and went out. So yeah, this will be a 3 person operation! Meanwhile Cheval, Hyoro and Mille. Theya re at a desert area… Various desert monsters are in there, their form is unknown so they can be Cephadromes or Delex. In any case Mille asks Cheval why he didn´t invited Lute to tag with them? Cheval just says that the 3 of them are enough to handle this and… He wonpt get Lute to get the better of him. A feeling if anger can be heard in Cheval´s voice. In any case, the 3 Riders bring their Monsties and start the quest! A Village, a Felyne Village.The felines looks with curiosity to Navirou whose appearance is vastly different than themselves. In any case the Village leader, Cool, invites them in, so they go to his house, a very little one. The leader tells them that he hasn´t heard anything like Kinship Ore; but they have a Kinship Boulder in their sacred land; but Humans can´t see it, only felines. Navirou enters the conversation and tells him that if that´s the case then he should let him see it! Cool then ask Lute and Lilia… What is this thing that speaks? A stuffed animal? A normal animal? Or what?! Navirou, all insulted, says that he is a Felyne! Like Cool and the other people at the village! After some discussion it came to the conclusion that Navirou must be a different kind of Felyne, in any case even if Navirou is a Felyne he needs to be a member of the village and takes the coming-of-age ritual. Little later Navirou was studying that weird chant that says a lot the word “Mew” in roder to be part of the village and enter the sacred ground. Suddenly another weird looking Felyne comes and calls him “Number 5”; Navirou ask him who he is and says that he is the number 1, Beats! In any case… Navirou is not amused. In any case Beats tells him that both of them are friends! Navirou don´t believe him and says that he won´t fall for any scummy scam that this weirdo in front of him is pulling. Beats bites him (twice already) and shows him the mark they have on their paw, the mark of the numbers… Navirou has it too. Beats then tells him that he is in here for the same reason as him…To see the Felyne´s holy ground! Navirou ask him if he is going to do the ritual thing? Which Beats says that nope, he-well WE- are going to sneak in! Beats looks an opening and tries to enter, Navirou follow him shortly; but he is stopped by the guards, he says that he was just looking. Suddenly an alarm is heard and… Beats got captured. Little after that Beats is in the village all hunged up and the people is thinking in his punishment, which it seems it will end with death. Navirou then interfeers –since Beats was imploring him- and says that Beats did nothing wrong, he didn´t looked at the thing, he was just lost and enters juuust a little bit. Cool has none of it, especially for a foreigner. So for that, Navirou decides to do the ritual and enter the sacred ground—and save Beats, maybe. Navirou sees it and runs fast to save his life against the clutches of this beast, he informs Lute that a Monster was there; Lute see and is!... An Aptonoth. Lilia tells Navirou that the Aptonoth don´t hurt anybody. Later Navirou is doing the chant and the dance for the offering…Although it is nothing to write home about…In any case his next mission is next. Cool gives Navirou a staff, he has to go and fight a Genprey and catch his fang! Genprey, the small version of the Gendrome and cousin of the Velociprey, This monsters tend to attack in packs be quite violent in group; although alone they don´t do much damage, at the same time they are weak, still one has to be warn of their paralysis spit! Navirou then tells the Village leader that this is demanding for peaches to the Apple tree since Navirou is not a fighter! He Is an strategist who is better suited to the backlines! Still after the cry for help from Beats, and the insistency in Lute and Lilia, Navirou goes and takes the next part. 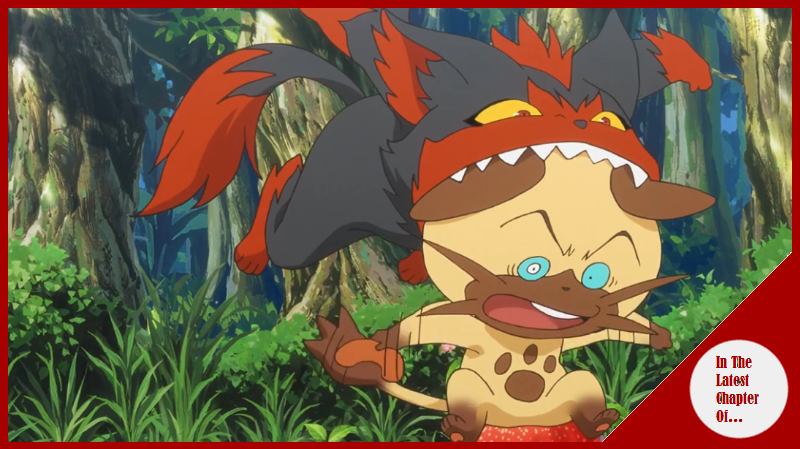 Navirou awokes full of energy, power and killing intent against the Genprey and goes to attack again! Lute asks Lilia what was it and she says that ti was Demondrug… Although Demondrung normally does not become one berserk, just increase the strength. A Gendrome! The Gendrome, the leader of the Genprey, it´s bigger and stronger, also it can call various Genprey to help him in battle! The other Felyne comes in help of Navirou. Then the Gendrome do his call and various Genprey appears, the Felyne are in a tough spot right now! By seeing that the Felyne where in problems. Lute decides to enter and calls for his new Monstie, the Basarios! Basarios a stone Monster, this monsters have a very tough skin, like a rock and even some precious minerals can be found in them, they can throw fire lasers from its mouth or take out heat or sleep breath from its skin, in truth they are a pain to deal with! With a few attacks Lute is able to repel the Gendrome! Cool and the other Felynes are truly amazed by what Lute did since… It seems he is a Rider, and Navirou must be his Felyne Monstie! Although Navirou says that he is the Navigator! The Boulder is another ugly statue that tells part of the history of Redan, the legendary Rider; although this tells more about his Felyne Monstie, a brave Felyne who helped him in saving the world, and made Kinship with Humans, uniting their destinies. Still… It seems that in truth there wasn´t any Kinship Ore in here… Oh well, at the very least they sought something cool. After that in the village, the Felynes lets Beats go…In a way, and they warn him to never come back to this place! Still Beats told to Navirou to accompanying him since they are friends! He must remember!...And so Beats goes with the River´s flow. Later Lute and Lilia are going back home, talking until…They detected something. Debli in some point join them and Navirou is nowhere to be seen. A very funny chapter, also some chapter where we got more information and answers! I truly liked how the whole chapter felt since there wasn´t any boring part in this! I mean man Navirou was the star of the show; but he didn´t felt annoying (which lets admit it, sometimes he is) so yeah, it was like the best of Navirou! At the same time we sought a little of the other especial Felynes, in specific to Beats, still I think they will show in some weeks later. Now… Man Lute is getting a truly nice collection of Monsties since he has Velocidrome, Gendrome, Yian Kut-Ku and a Basarios now!